Yamaha P71 Review - Is this keyboard any good for you? Today’s piano review will focus on the Yamaha P71. We’ll look at every aspect of the piano – the good, the bad, and the ugly, and find out how the P71 does in every department. We’ll start by looking at some of the key features of this piano. We’ll look at what it does well, and the things it struggles with. The keyboard is one of the most important aspects of any electric piano. Well, for one thing, this is the only part of the instrument you make direct contact with. The way that the keys look and feel really make a difference to how you play the instrument. These features basically define the experience you will have with the piano. Though many things distinguish electric keyboards from acoustic pianos, there is one thing that should be the same. Many electric keyboards, especially on the lower end of the price spectrum, don’t get this right at all. For one thing, the keys provide almost no resistance. They are as light as a piece of plastic, because that is all they are. 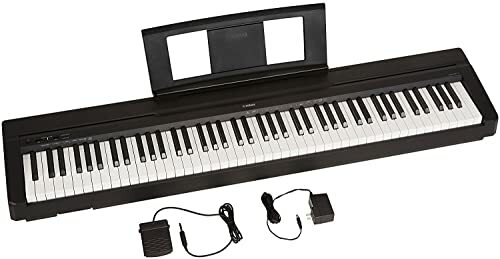 There is no natural reason for an electric keyboard to have weighted keys. The nature of the instrument does not make it necessary, but best playing practices do. Weighted keys play more naturally, and they also will help you easily transition to an acoustic piano. Even if you have no plans of playing an acoustic in the near future, you should at least be able to. This keyboard takes things a step further and also grades the keys. This means that the keys at the low end are heavier than the ones at the high end, just like those you find on an acoustic piano. The grading feature provides more realism to the keyboard. It is also worth mentioning that this is a full set of eighty-eight keys. This may sound obvious, but many keyboards do not have a full set of keys. We should start by saying that in the world of electric keyboards, the term “voices” basically means sounds. The sounds could be instrument tones or an effect. In the case of this piano, you get ten sounds. These sounds include tone samples taken from real Yamaha grand pianos. Granted, this is not to say this instrument will actually sound like a grand piano. If you want grand piano quality, you have to pay grand piano money, unfortunately. Price is not necessarily a feature, but it is an important consideration of any purchase. The P71 is on the lower end of the price spectrum. 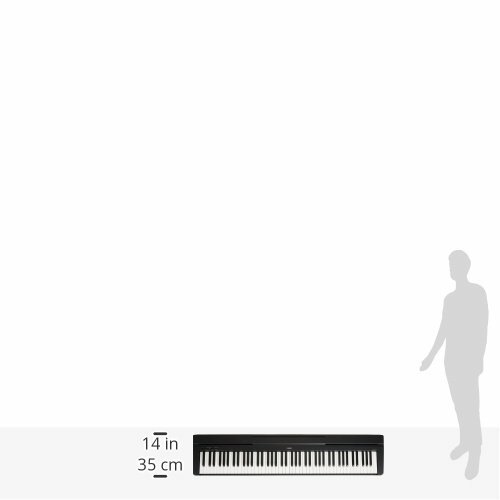 Though there are cheaper pianos out there, they don’t come with the same high-quality range of features. If you want quality at a reasonable price, this is definitely a piano that is worth taking a serious look at. It is also worth mentioning that this keyboard comes with pedals. If you are not familiar with the world of keyboards, you may be surprised to learn that this is not a given. The unfortunate truth is that many keyboards are not supplied with pedals. They either need to be bought separately or just can’t be used at all. Naturally, this is disappointing as pedals are invaluable. You get two of them here. The inclusion of the pedals is a nice touch for an affordable package in which accessories aren’t always a given. There aren’t a lot of cons that are worth mentioning. One thing that any buyer will want to keep in mind is that this is a pretty bare-bones package. You get the piano, and the pedals, but no stand. We also noticed that the keys make a clicking sound when you play hard on them. This isn’t necessarily a huge con, but if you are a perfectionist, you will probably find it irritating. This aside there isn’t’ anything worthy of reporting. You’ve seen the ins and outs of the Yamaha P71 at this point. Now it is time to bring everything that we have learned together. Read on for some pros and cons that will help you make your buying decision easier. Keys are squeaky when played hard. So what are our thoughts on the Yamaha P71? As you can see, there really is plenty to like here. For the price, it’s hard to find anything that can beat this option. 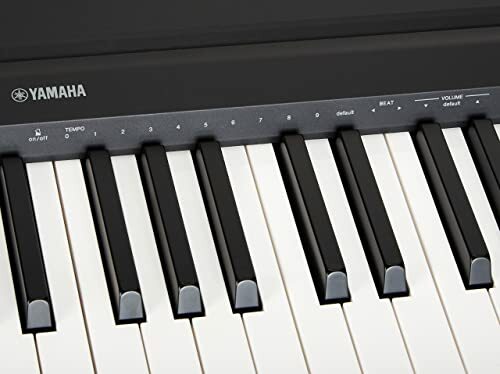 The Yamaha P71 is very affordable and comes with many of the features you would expect from a more expensive piano. Though not perfect, the flaws of this unit are pretty minimal, and won’t preclude the budget-minded buyer from buying this instrument. We, therefore, end by saying that this is an excellent piano for the price and that most buyers will really appreciate owning a Yamaha P71.